Well the garden has about six more weeks before the frost comes, so now are the golden days. Beautiful vine ripe tomatoes that you can pick, cut thick slices for salami-tomato sandwiches, and throw the rest away. But what about that low-carb diet your wife has you on? That sandwich just isn’t going to cut it, so you go back to the garden and forage. 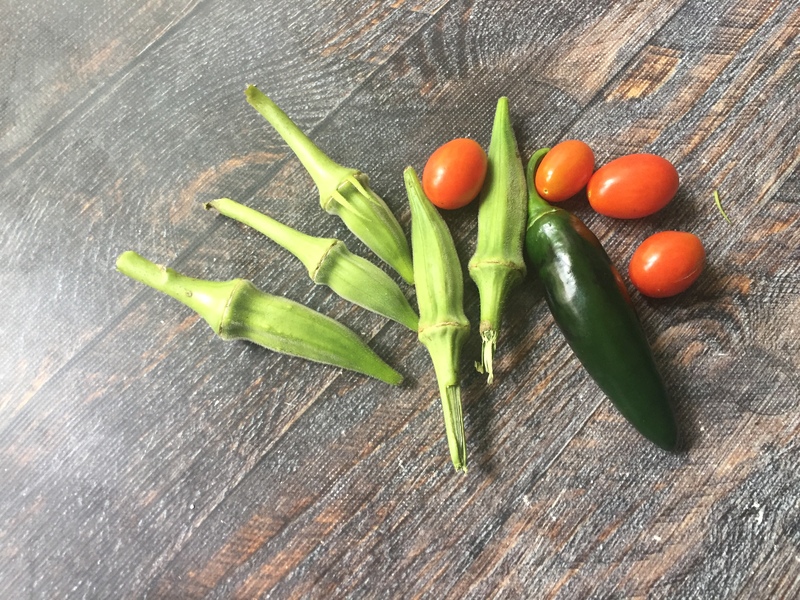 I came back with the tail-end of my okra crop, a handful of cherry tomatoes and a jalapeno pepper. 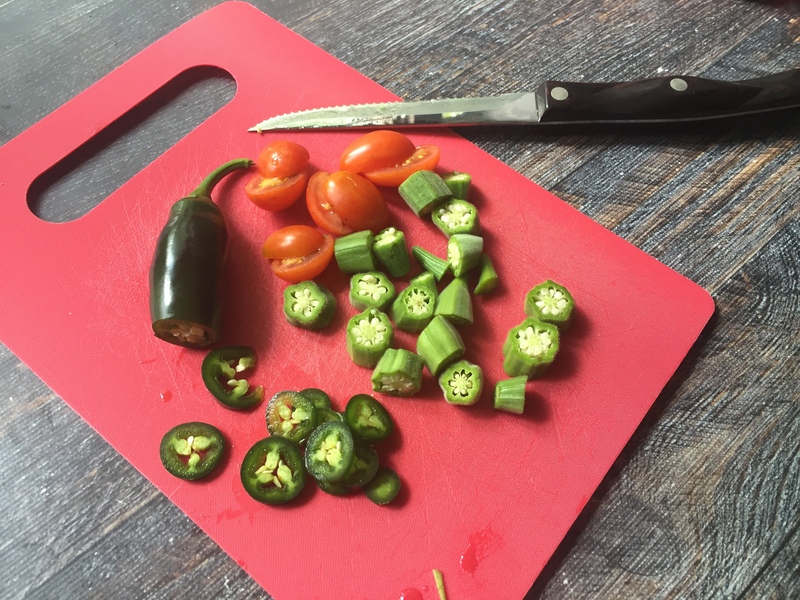 Why plant okra in Pennsylvania? When I was a kid, I never heard of okra. It’s a southern thing that can’t grow up here in the frozen north. As I’ve matured (some may disagree), I have learned to like it, especially in spicy dishes with tomatoes. Global warming has us in a better growing season, so I got one plant this year. It grows like a weed, but it doesn’t make a whole lot of fruit by itself. So the okra is the weak link in this chain. So here I have a few okra, some little tomatoes and my chili. Let’s cook! First cut the hats off the okra. Second, cut the tomatoes in half. Third, cut as much of the chili into thin slices as you want. Then go get your handy-dandy microwave vegetable steamer. I’m not sure where Denise got this thing, but we use it all the time. Ok, I took a minute and looked it up. Now typically, when I use this thing, I put about a quarter cup of water. Don’t do that with okra. There’s something about the sticky sap inside the fruit that makes water boil over and coat your microwave with slimy juice. So I just put a splash of water. This sorry bunch will only take a couple of minutes on high. 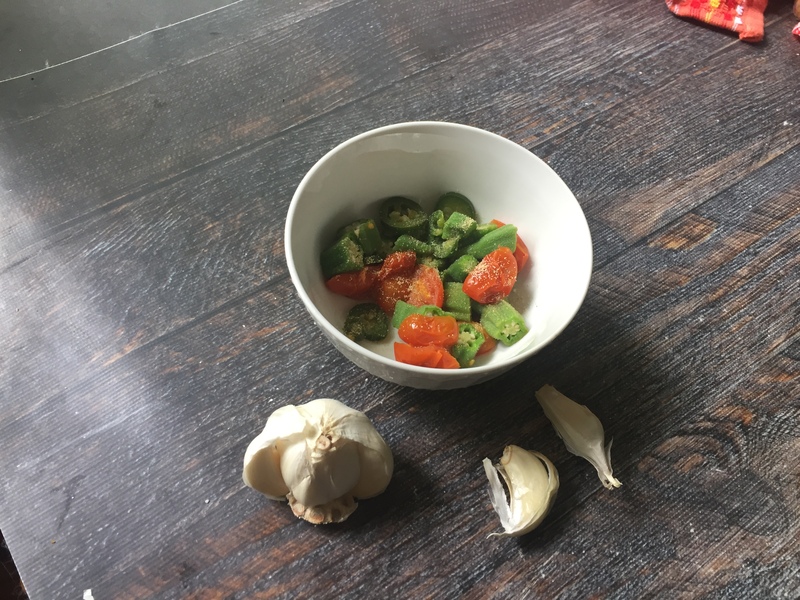 I like to sprinkle a little garlic on there and you have a nice snack that took you about 5 minutes to make and about five seconds to eat. Plant more okra next year! 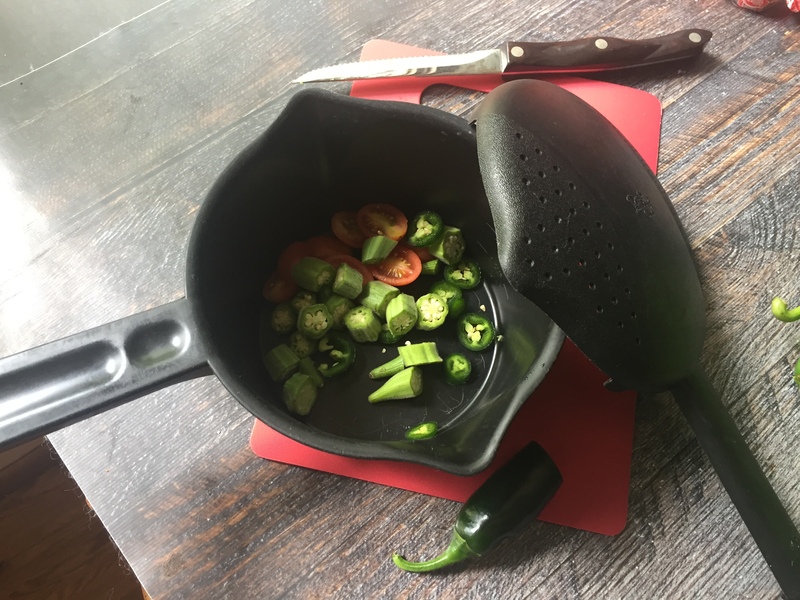 That is a sad little bowl but I have had your okra dishes and they are delicious! Plant more next year!!! Yes, yes. Plant more okra.